It’s Monday, and on most Mondays we need some type of motivation to get us out of the post-weekend slump, get active, and go to the gym. If you’re seeking some serious exercise motivation, look no further than the first official poster for the Tomb Raider reboot, featuring Alicia Vikander with guns blazing. 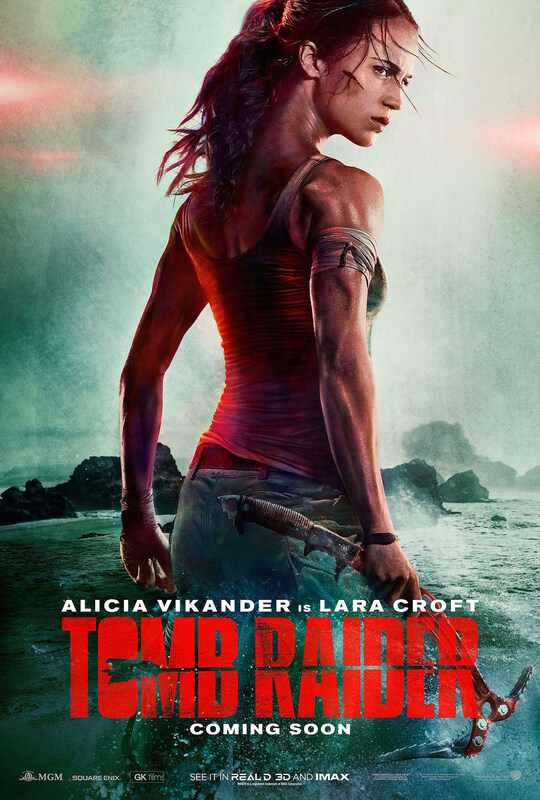 Warner Bros. dropped the new poster for their Lara Croft reboot this afternoon, featuring Vikander as the titular raider of tombs. She’s sporting the same camo tank top and cargo pants we’ve seen her wearing in previous press stills, only this time she’s bloody and – holy crap, look at those delts and tris! If Planet Fitness hasn’t already partnered with Warner Bros. on a Tomb Raider workout routine, they best get on it quick. Vikander brings the video game character to the big screen in an origin story tale that will detail how she came to raiding said tombs. The Oscar winner underwent some intense training to prepare for the role, hung from some cliffs, and was even thrown into a river with her hands tied behind her back (!) as shown in the teaser above.